Sage 300 is a highly adaptable solution, simple to use and provides best-in-class solutions to automate and improve the workflow throughout your organisation. Unlock your business growth potential with Sage 300. ​Download our FREE information booklet for more details. Sage 300 brings data visibility and real-time access across an entire business without the costs or complexity of traditional ERP software. Whether you are operating from one location or multiple locations around the world, Sage 300 can easily manage your finances, operations and inventory and report on your key performance indicators. ​Tap into real-time, unified view of your company's finances and operations. Reduce inefficiencies and redundancies to improve performance and productivity. ​Integrate front-to-back office processes such as marketing, sales and customer service. ​Sage 300 is one of the most widely used business management solutions for small and medium companies in the world, connecting the most critical parts of your business. 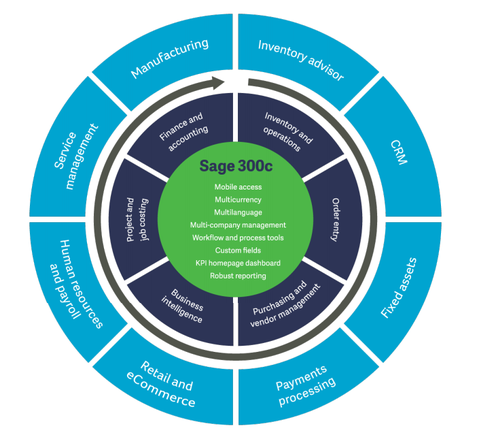 Sage 300 offers all the features you would expect from a powerful solution and takes care of your financials, warehousing, manufacturing, sales, CRM and service management into one package. Built on the most flexible and expandable architecture available today, Sage 300 is a powerful, customisable and multinational business management solution which can run both on-premise or on-cloud depending on your requirements and preferences. ​WMSSoft assists companies build their future. We have software developers, financial and​ business consultants as part of our team to help build answers to your complex problems. WMSSoft is not only accounting and IT savvy, but also business smart. COPYRIGHT © WMSSOFT PTY LTD 2019. ALL RIGHTS RESERVED.